"Dupuytren's contracture is a progressive fibrous proliferation of the palmar fascia of the hand. It is a tumor (growth) but not a cancer. Similar type fibrous growths may also occur in the fascia of the feet and there it is called Ledderhose disease. There is no known cause or etiology for Dupuytren's. It is considered an inherited condition and not related to work or hand use. The disease is metabolic and genetic in nature. Dupuytren's is often observed in persons of Northern European descent, especially Scandinavians. It is sometimes called the "Viking" disease although the "Viking" theory of disease and spread is disputed by some authors [1, 2] Diet does not seem to have an effect, or change Dupuytren's although diabetics have a higher incidence of the disease. The disease occurs worldwide in all races, but is most concentrated in Scandinavia. I have personally treated Africans and Chinese with this disease. Dupuytren's is found more commonly in men[4-6]. There does not seem to be a specific relation to labor or work, and it is not covered by workers compensation, although exposure to vibration may increase the risk of developing Dupuytren’s. In a study in Norway, Dupuytren’s was more common in those that labored with their hands rather than those with sedentary work. A French study also confirmed slightly higher Dupuytren's in those that labored with their hands. The cause of the disease is unknown and it usually presents later in life. It has been reported in children[11-15]. Trauma, such as a fracture has been reported to bring on Dupuytren’s. It often starts as nodule in the palm that is composed of fibroblasts. After this, the nodular growth may start connecting and contracting. One will notice pits or grooves in the skin and there may be associated pain or tenderness. Microscopically, myofibroblasts may be found and these are the cells that start the contracture. At this stage, the composition shifts to more type III, and type V collagen. Late stage Dupuytren's is characterized by metacarpophalangeal (MCP or first joint), proximal interphalangeal (PIP or middle joint), and rarely distal interphalangeal (DIP or distal joint) contractures. The disease most commonly affects the ring finger, and the little finger is second most commonly affected. Correction of little finger PIP joint contractures (middle joint) are the most difficult to treat even with all the tools available to modern medicine such as needle aponeurotomy, surgery, skin grafting, or XIAFLEX (collagenase) which dissolves the cords. Thumbs, index, and middle fingers may also be affected in some patients. Some medications that have been tried are allopurinol[49-51] , colchicine[52, 53], vitamin E[49, 54-59], calcium channel blockers, interferon[49, 61, 62], DMSO[49, 63, 64], and NAC (N-acetyl-L-cystein)[65, 66]." 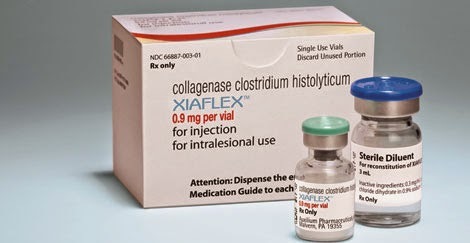 Xiaflex is a new treatment option for Dupuytren's contracture as well as Peyronie's Disease that is based on collagenase. It is worth looking into, but unfortunately, it is expensive, requires injections into the hands, and long-term studies are limited. 1-Take NAC (N-acetyl-Cysteine) in supplemental form daily. NAC has been proven to be effective in helping to slow the growth of Dupuytren cells in patients with Dupuytren's Contracture. 2-Apply DMSO directly to the areas affected with Dupuytren's Contracture. DMSO, which is a topical treatment, helps to reduce pain by inhibiting the transmission of pain messages. DMSO can also sometimes soften the abnormal connective tissue that is associated with Dupuytren's Contracture. 3-Take a Vitamin E supplement daily. Continue this treatment for a total of 3 months to see the full resuts. 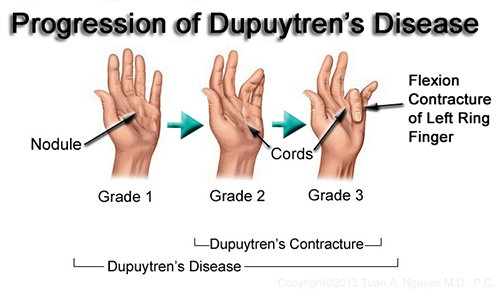 If the treatment has improved your Dupuytren's Contracture than continue taking between 200 and 500 mg daily. 4-PABA or related compounds. The potassium salt is used as a drug against fibrotic skin disorders, such as Peyronie's disease, under the trade name Potaba. 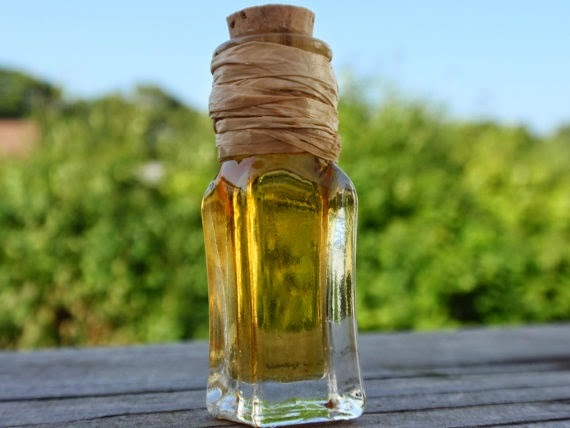 "For these conditions, it’s additionally helpful to take para-aminobenzoic acid (PABA) 2 grams, three times daily, and to rub a mixture of Vitamin E and DMSO into the thickened areas, also. However, if “caught early”, SSKI alone will often “do the job”. (It’s also advisable to have glucose-insulin tolerance test done, as there’s an unusually high incidence of “insulin resistance” in people with Dupuytren’s contracture or Peyronie’s disease." Sunscreens ... protection from cancer? BPA, BPF, BPS, what's the deal? Cold Hands / Cold Feet? Is the can giving you high blood pressure?